What are the priority areas to develop in Kazan in the next five years? What activities are planned in the capital of Tatarstan in the year of water protection zones? What will be the general plan of development of Kazan? How will change the transport system of the capital of the republic? How citizens can make their own contribution to the development of the beloved city? the Mayor of Kazan Ilsur Metshin said on these and other issues within the online conference held in the portal TatCenter.ru February 18. The Mayor has launched a series of meetings of residents with the heads of large municipalities and cities of the republic. Olga Petrova: Ilsur Raisovich! I respect your work, wish you success and patience. The question is: how can we take part in the development strategy 2030, where to send our wishes? And most importantly, how city council, the executive committee will work with the wishes of the citizens? I.M . 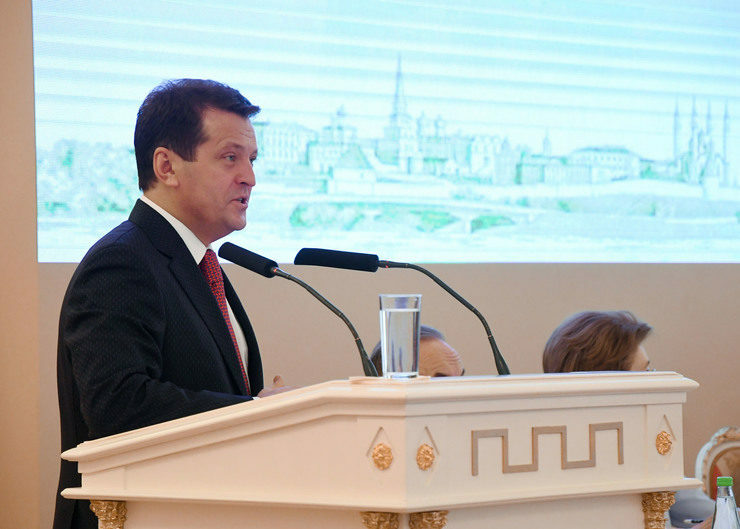 : I am very happy that my call to take an active part in the drafting of Kazan development strategy is heard, and people began to think about this important issue, though I appealed to all residents of the city with the request just last week. I have always been convinced that active and indifferent people live in our city who can work together to do things to do and to think about the public interest. It is really important to hear your suggestions. What should be the Kazan in 2030? How we see the future of our children and grandchildren, what you need to feel comfortable in retirement? How current generation of students and pupils see Kazan? What they lack, what do we need to do for them to continue to learn and work, to create their own family and raise children here in our beautiful city? This is not an empty pathos, but it really is a case where everyone's opinion is important. It will be heard and carefully considered, all the good deals will be included in the "Strategy 2030". As for where to send comments and suggestions. Now you can send your suggestions to the official portal of the city. A little later we will open a separate web page devoted to Kazan Development Strategy. Adeline: How do you see the strategy of socio-economic development of our city until 2030 - on a long-term perspective? What are the primary goals to put it, what problems to solve? I ask the question because I think that the strategy until 2030 – it is too long, how it will be realizable? I left Kazan and haven’t lived here for 5 years. I get out of the provinces, arrived back to one of the best cities in Russia. Everything is changing dynamically. Is it relevant to plan for such a long time? Why is it necessary? I.M . : Thank you for the appreciation of the changes in the city. But I cannot accept the fact that Kazan was a "province". We have always been the educational center of the Volga region. Multicultural city with a unique history. The names of people who was born or worked in Kazan are known around the world: Derzhavin, Lobachevsky, Gabdulla Tukai, Butlerov, Chaliapin... It is not enough time to enumerate all. But you are right that Kazan really changed dramatically recently. But these changes have been made possible precisely because it was a dream at first. Without it we would not have achieved such a transformation. The celebration of Kazan Millennium, World Summer Universiade, the World Championship in water sports helped us. But we cannot rest on our laurels. Therefore, we should try to model our future. The more precisely we will imagine our dreams, the more aspects of city development we will take into account, the more likely it will be able to move to a new purpose and make Kazan more comfortable place to live. Therefore be active in the discussion! R.Bagautdinov: I have a question. You have announced a large-scale inventory of land near the water in the Year of the water protection zones in Tatarstan. When the inventory starts, when it is planned to be completed, which place, areas / objects will be the first and how you plan to check on your expectations, what should be a key result of the inventory of land at the coastline of Kazanka? Can Kazan residents appeal somewhere if they find that the territory by the river is occupied illegally? I.M . : By the Commission on the coordination of anti-corruption in the Republic of Tatarstan from 11.30.2015 No. Pr-355 it is recommended to take an inventory of land in the area of water safety in all the municipalities of the Republic. It has been arisen in connection with the announcement of the Year of water protection zones in Tatarstan, and, I hope, it will help us to focus on such an important issue as the prevention of violations of water law and ensuring the availability of water bodies for all citizens. It is no secret that the reality is far from the ideal described in the law, which says that every citizen has the right of free passage to the borders of the water body. We have a lot of occupation, where some areas in floodplains are simply resemble a landfill. And in order to bring order in this matter, it is necessary at least to start with an inventory. This work has already started in the past year. In the waters of the Kuibyshev Reservoir Committee of Land and Property Relations of the Executive Committee of Kazan inspected 690 plots of land along the coastal strip of the reservoir, 178 offenses were revealed, 80 were sent to court, there are 69 court decisions of obliging to release illegally occupied land. This year, as soon as weather conditions will permit, we will take stock of land at Kazanka coastal line within the boundaries of the city of Kazan.